Location: A farm track passing Birch Farm stops at the railway line, Barton Moss Station was sited to the east of this point. Notes: Barton Moss (1st Station) was one of the original passenger stations of George Stephenson's Liverpool and Manchester Railway the world's first railway to cater for passengers as one of its primary functions. It was also arguably the worlds first inter city railway. When the line first opened on the 15th September 1830 no details exist of the initial intermediate stops and Walkers accurate description of the line at the time of opening says that fares for intermediate stops had not been settled implying that initially there might not have been any stops. There were many early changes of stopping place and name so the early history of intermediate stops is patchy. At first trains stops at, for example, level crossings where the gatekeeper issued tickets; perhaps a room in his cottage was available as a shelter. In 1841 platforms and nameboards were added to stations lacking them. Many of the stations consisted of little more than a basic cottage. The company timetable of 1st March 1931 includes a Reids Farm Station, this may be an early name for Barton Moss or perhaps Barton Moss replaced it on a different site. Barton Moss is listed by September 1831 but has closed by November 1832 in favour of nearby Lambs Cottage but is back in the company timetable by 19th October 1839. Early timetables show the first Barton Moss station to be located 23¾ miles from Liverpool Lime Street. The early wayside stopping places on Chat Moss had no platforms. The station would have been served by local trains running between the two cities or on shorted journeys. A steady stream of express and goods services would have passed through. Barton Moss was replaced on 1.5.1862 by a 2nd station located ¾ mile further east, adjacent to the present Barton Moss level crossing. 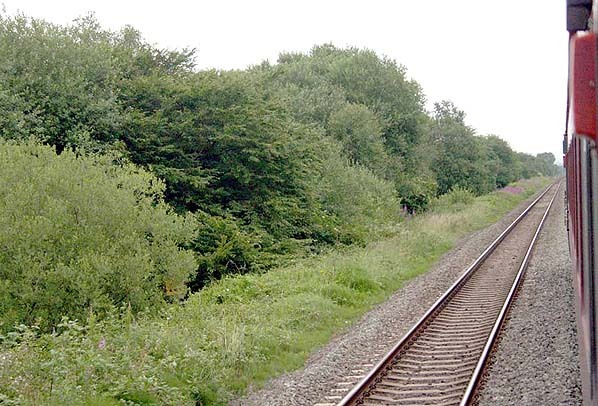 There is currently no road access to the site, but an unnamed track terminates at Birch Farm (originally Barton Moss Farm), a short distance south of the railway (OS Explorer Map 276), and this was probably once an access route to the station. from the north side of the line. these were probably for peat cutting.